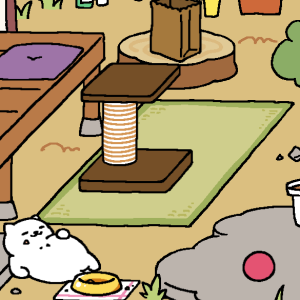 Neko Atsume has been downloaded millions of times, a number that even surprises its creator. It certainly doesn’t seem designed for mainstream success. Most free-to-play games are like a dog: overeager for your attention, always reminding you that it’s ready to play, and asking you to take on the unpleasant task of paying money whenever it feels a certain urge. Maybe it’s because I’m a cat person, but I prefer Neko Atsume‘s approach. You stock a patio and eventually an entire apartment with cat food and toys. However, nothing happens when you’re paying attention to it. There’s no juicy reward, no timers counting down. You have to close the app and return in order to see if cats have shown up. It doesn’t even issue push notifications to let you know when something happens. You must remember the game and choose to check on it to see any progress and, if you’re lucky, take pictures of any cats that haven’t already left. More often than not, the progress you find is that a fat cat has eaten all the food. The game is especially inscrutable to me because it’s in Japanese. Since I only speak English, playing the game is a process of interpreting icons and remembering which side of a dialogue box means “OK” and which half means “Cancel.” But even when translated the game remains mysterious. Special cats have certain toys that trigger their appearance and, when they visit often enough, they give strange treasures. Cats have names and personalities that don’t seem to have any direct relevance to the mechanics. Often, you’ll return to the game to find a cat has come and gone, leaving behind only some dried fish and a silhouette in your visitor log. It’s almost shocking how little the game pushes itself on you. It doesn’t make you feel bad for leaving it alone. At the worst, leaving the game alone results in a less efficient collection of currency and cat photos. Far better to be like a cat. Far better to keep in mind the hoary adage, “absence makes the heart grow fonder.” Neko Atsume knows that true love means being able to sit quietly with your partner in the next room, confident that they care for you and will seek your attention when they want it, not just to verify that you still breathe. But how do we channel that feline spirit? First, as always, is to have any sort of spirit to begin with. Neko Atsume has, at its core, cute cartoon cats and a simple currency-earning and upgrade system. It knows what it is about and carries that out with aplomb. Second, let your players come to you. This requires a great deal of confidence that your game is good enough to draw them in. Useful notifications aren’t a bad thing, but if a player wasn’t convinced by your useful notification, a nagging one a week later won’t endear them to your game. Finally, don’t take the feline drive too far. Cats certainly have negative traits. Don’t insist that your players jump through hoops to play the game; this is like crying for food in the middle of the night. Make your work accessible for when your players feel the urge: implement convenience features to make their experience as smooth as possible. Don’t be confident to the degree that you become rude. Vomiting up a hairball of entitlement, acting like your game is doing its players a favor, will only drive them away. Recognize that the player-game relationship is mutual: players are benefiting you just as much as you benefit them. And don’t scratch your players when they stop coming back. Players may drift away, and that often means that they’ve lost interest, but don’t assume that. If they come back after months away, they shouldn’t return to shredded furniture and an overflowing litter box. Forgive your players for drifting in a way that cats often don’t. Neko Atsume has the dignity of a cat without the shedding or the claws. Learn from its example. This post was commissioned by one of my patrons, who seems to be fond of getting me to write about animal games. To request posts of your own, become a supporter.